A perfect hunting season companion for the entire season when targeting moderately sized game, or an equally interesting choice for a day on groundhog duty or in similarly placed varmint activities. 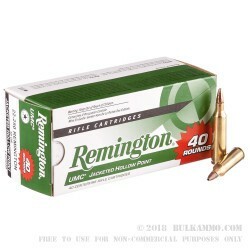 This is a 40 round value pack of ammunition in the .22-250 Remington caliber that offers very high-end components and an overall impressive build quality in a round that has as much history as any famous American round. 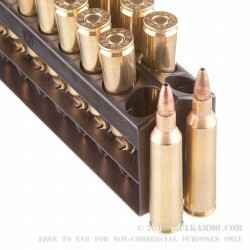 This round actually contributed heavily to the research, development, design and acceptance of the 5.56x45 round that has been the cartridge of choice for American Armed Forces for decades. It still has myriad uses in the bench rest world as well as being a top tier choice for dispatching annoying groundhogs, or other varmints at extreme distances with extreme prejudice. 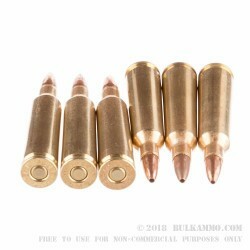 This is a flat shooting, high powered round with a nice projectile that in this case is a 50 grain jacketed hollow point. The ability for accuracy and the clean reliable performance of this round makes it the bolt action dream round with a tack driving, flat shooting cartridge that exerts little to no recoil to the shooter and give sub ½ MOA accuracy in most guns built for it. 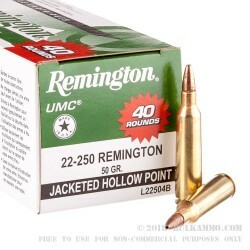 Q: What is the listed speed in ft./sec for this cartridge? A: The muzzle velocity is listed as 3820 fps.